Here we are at the end of another calendar year! It always amazes me how quickly these years pass, but one of my favorite parts of closing the book on the year is taking a moment to share with you my favorite businesses and contractors. Each year I like to give a nod and a big thanks to all the folks who helped keep things running smoothly, helped make the Welter home prettier, contributed in making life easier, more organized and less work. I hope that in doing so, you might find someone you could use in your life too. Good help is hard to find and when I do, I like to make sure they know how much we appreciate it. My list this year is long; I don't want to leave anyone out, so sit back and take notes as I share my 2018 Favorite Contractors and Businesses. Green Gardener LLC - Maia van Holsteijn, a Bachelor of Science Graduate of Iowa State Horticulture Program, provides a variety of outdoor services including spring clean-up, weeding, mowing, bulb planting, landscape design, pruning, vegetable garden design and planting, indoor plant repotting, and general yard maintenance. I enlisted Maia for a number of gardening jobs this summer beginning with dividing and transplanting a bunch of perennials, revamping a forgotten garden, weeding and some fertilizing. Maia worked tirelessly and efficiently, regardless of the heat and humidity, and always got to me in a timely fashion. I can't say how nice it was to be able to enjoy my gardens without having to do the work! I highly recommend you give Maia a call at 712-240-6242 or you can email her at info@GoGreenGardener.com. Be sure to check out her website: https://gogreengardener.com/ for more about her and her services. Kulak's Nursery - This spring we tackled a long-overdue project of re-establishing the landscaping in the front of our house. You may have seen the blog post about it (https://www.lifeasiseeitphotography.net/2018/05/one-yard-several-gardens-and-two.html) Well, Pam at Kulak's was instrumental in helping us select a group of new plants and shrubs to fill a rather large area. Not only did she have a great eye and good ear for listening to my likes and preferences in plants, Kulak's had a large variety of healthy specimens which all thrived in their new home. I would highly recommend them for all your gardening needs. http://www.kulaksnursery.com/ You can see the before and after of that product in the blog post (link above). Petrecki & Son's - You'll probably recognize this name from all of my previous Best Business lists - because Mark Petrecki is one of my favorite contractors. Mark has done a laundry list of jobs for me including a very massive and beautiful retaining wall, a sidewalk, basement window replacement, and water-sealed a leak in our foundation. This year he expanded from his hardscape work and moved towards some soft scaping. Mark was the lead (and only man) in our landscape project removing a couple dozen astilbes and several fern, along with some Rose of Sharon. He then amended the soil, laid edging, planted all the new nursery plants, laid stone under the drip edge and mulch over the new plants. Then this fall when I wanted to put up a simple little background fence, Mark made time in his schedule to build a masterpiece for me. That's what Mark does....he takes your vague vision and combines it with your need and he weaves his magic with muscle to create something far more beautiful that you could have dreamed. Just look at this fence.....all built one piece of lumber at a time, from scratch, from Mark's design. Mark is a perfectionist, a disciplined hard worker and one of the best men you'll ever meet. All of that just makes him that much harder to schedule. So line him up now! You can find him at https://www.facebook.com/petreckiandson/ 518-858-6810. Daigle's Automotive - Located on Vischer Ferry Road in Rexford NY, Daigle's is an old-fashioned, friendly, personal and top-notch garage where you can get honest, fair-priced auto repairs. At Daigle's you won't get stuck paying for a bogus diagnosis. What you'll get is an honest diagnosis, a clear explanation of the repair needed, and the ability to walk away if you choose. But you won't walk away because you'll be confident that you're receiving an honest diagnosis and a repair at a fair price, each and every time. At Daigle's you'll receive the fastest and fairest service around .....whether you're a man or a woman, you'll be treated with friendly, polite service and women....you won't be afraid to get taken advantage of. There's a reason why Daigle's has been in business since 1983! They're that good. For your next auto repair, call Daigle's at 518-383-2689. 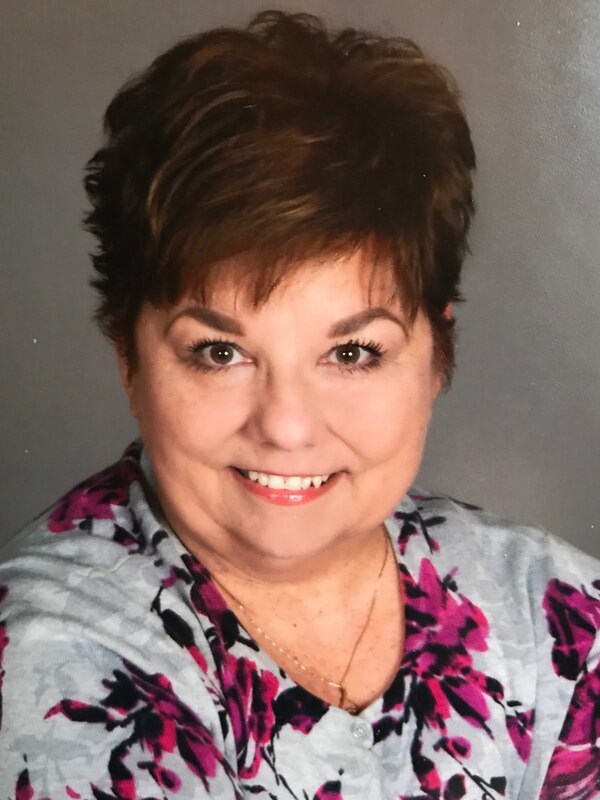 Staples - For your printing needs....This year I decided to convert my "Food for Thought" blog posts and family story blogs (over 40) into a word document to preserve for my grandkids. I wanted a printed document that would remain long after I was gone and I knew that would be too cumbersome for my home printer. I made a few phone calls and enlisted Staples to complete my project. Easy Peasy! I just copy and pasted my project from the blog (without formatting) into a word document, added the photos and saved. That part of the project took me about 40 hours, but the rest was a snap. I then chose my project style on the Staples website, uploaded my file and 7 hours later had a beautiful spiral-bound, 100+ page book. Who knew it could be so easy? I chose to do a color print, but I will tell you the black and white version was considerably cheaper - about a 1/4 of the cost of color. So if you've got memoirs or recipes or something you want to preserve, talk to the folks at your local Staples and have it done now! And the last but certainly not least business on my list this year is the Capital District Veterinary Referral Hospital - an emergency veterinary hospital in Latham. We were referred to them at 9:30p.m. on Christmas Eve when our 9 yr old cat Sophie had suddenly taken ill. We were told when we phoned that there was an hour wait and as it turned out, the wait was two hours. Who knew so many folks would have sick pets needing emergency care in the middle of a night on Christmas Eve? As it turns out, there were many - cats, dogs, bunnies. It made me feel a little less guilty that we were there on such a sacred night, a night that should be filled with joy and family. The staff at the clinic didn't seem to notice it was such a special night. All they seemed to care about was helping the animals and worried pet owners in their hour of need. 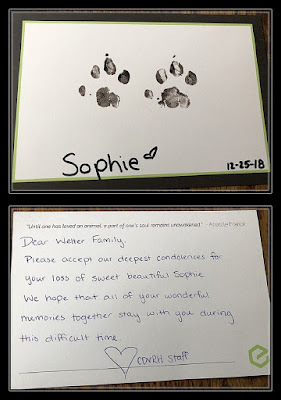 When we finally got our turn, and Dr. Robin Karfunkel talked to us about our options and it was decided Sophie would undergo a basic blood panel. That would hopefully help us determine what was going on that wasn't evident upon examination. Twenty minutes later, Dr. Karfunkel returned to our room, visibly sad. She compassionately apologized that the news was not good and definitely not the news she expected to have to deliver. Sophie was in severe kidney failure - in fact, she had only 1/8 of her kidney function left. 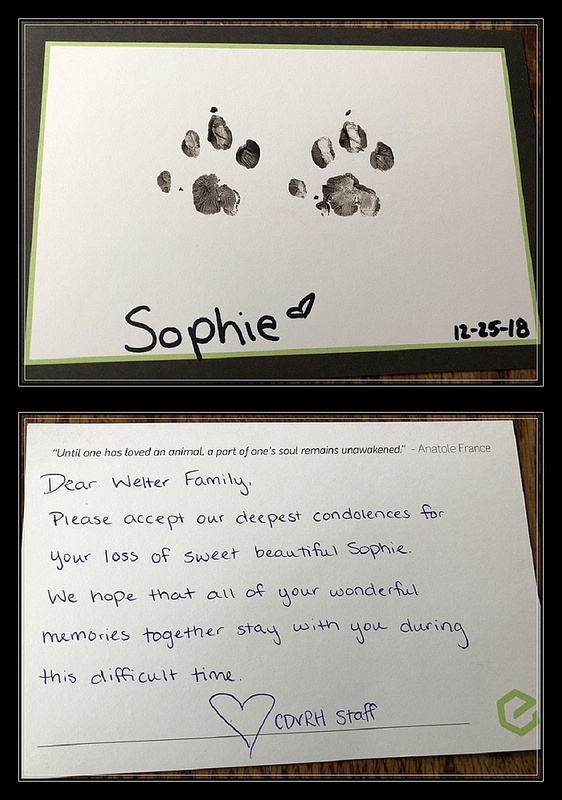 Dr. Karfunkel explained that we could try heroics - keeping Sophie in the hospital for 5 or so days on dialysis and medication, but there was no guarantee that would have any effect and would cost $6-8,000, or we could put Sophie to sleep tonight. Those were some pretty drastically different options - but options that seemed easy to choose from. Sophie deserved to die with dignity and not be put through heroics. From that moment, each clinic employee we came in contact with was so sincerely sorry for our loss, so compassionate, so kind. It was obvious that our loss was also their loss and they felt as sad to see us go home with an empty carrier as we were to do so. We left there at 1:45 a.m. on Christmas morning without our beloved kitty, with moist eyes and sad hearts, but we left feeling fortunate to have found ourselves among such caring and compassionate folks who truly care about the people and animals they serve. That compassion didn't end that evening. Two days later, we received this in the mail.. I hope you never need an emergency vet in the middle of the night, or on a holiday or even on a regular weekday night, but if you do, take your pet to the Capital District Veterinary Referral Hospital at 222 Troy Schenectady Road in Latham. You'll be glad you did. Good help is hard to find. I hope my list of favorite contractors and businesses will help you on your next project. Thanks to all who made it to this year's list. I'm sure there may have been one or two I missed. We feel blessed to have almost always been fortunate enough to come upon such quality folks to help us in our time of need. In the case of this year's list....these folks are of the highest quality, integrity and just kind and decent human beings. What more can one ask for when hiring help.....or making friends? That is how I feel about all of the folks on this year's list....people I like and respect, people we trust to handle our needs in the most competent and fair way, people who get it right and don't stop until they do. That's a big testimony and these folks all deserve it. I hope you are lucky enough to have your own list of wonderful contractors who are there when you need them and that you'll be inspired to take a moment to thank them for their service. The holidays can be pretty hectic, with the shopping and wrapping, meal planning and entertaining. Sometimes it's nice to just take a step back and pause for a moment, and remove yourself from the chaos to sit back and savor the holiday spirit. That's exactly what we did today! We got half of the family together and enjoyed brunch with the Big Guy (yes....Mr. C. himself) at Dock Brown's Lakeside Tavern. Now I know you're already questioning the validity of my facts. But trust me when I say we were with the 'real' man himself, Santa Claus. Most of you might know him as the Saratoga Santa, but in our house, this Santa is the real deal. 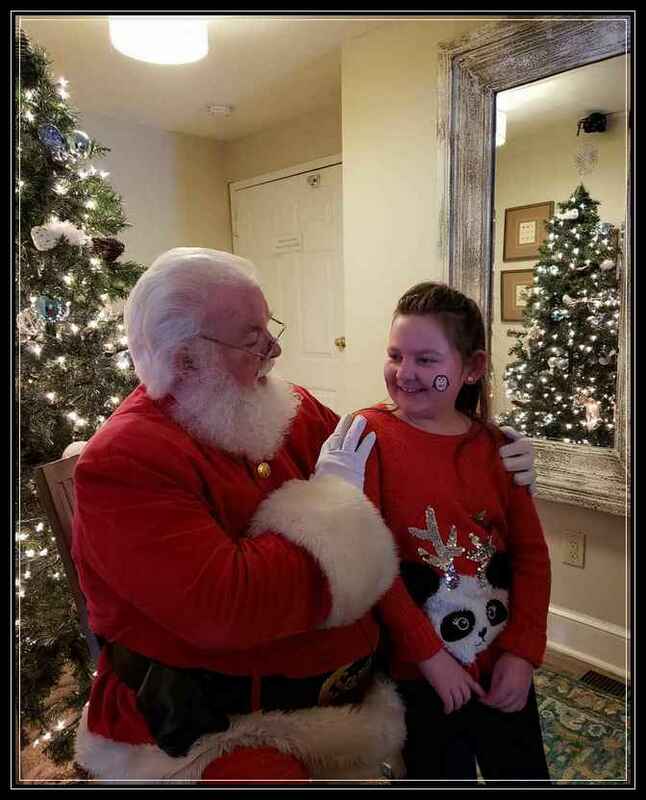 There were several opportunities to dine with Santa around the area, but we chose Dock Brown's for a couple reasons......1) Saratoga Lake is like home for me, 2) we love the Saratoga Santa and 3) we're familiar with the management at Dock's so we knew we'd have a great experience. Our reservation was for noon and Santa was scheduled to arrive at 1:00. There was no shortage of delicious food options ..... scrambled eggs, bacon, maple sausage, home fries, chicken tenders, chicken picatta, baked haddock, tossed salad and baked macaroni & cheese. There was something wonderful for every appetite. It was all delicious, but my favorite was the maple sausage!! 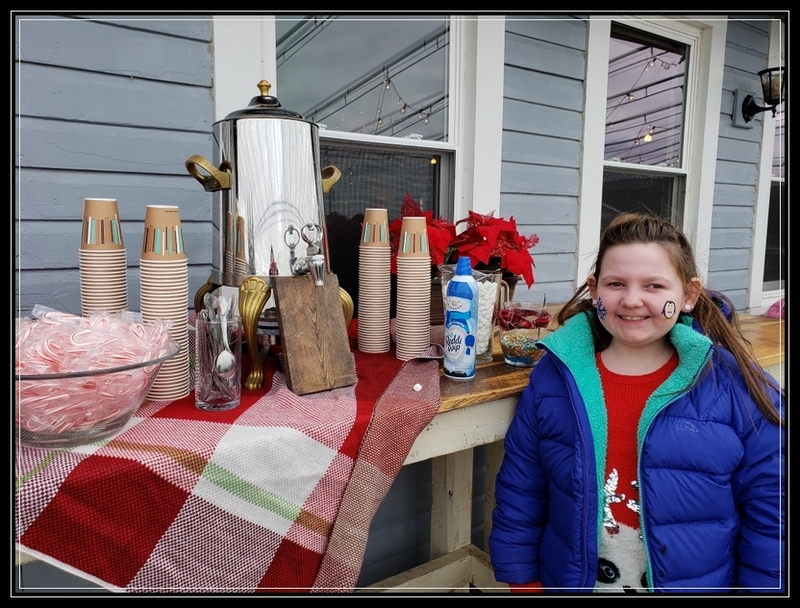 There were cookies from Bella Napoli and cheesecake for dessert and a hot chocolate bar out on the deck. Of course the kiddos couldn't wait for Santa to arrive and Dock's had that covered with activities to pass the time. There was a craft activity and face painting, both handled by the most patient and sweet elves! And finally as promised, Santa arrived! One of the things we really enjoyed was the relaxed pace and ease of access to Santa....thanks in part to the venue and thanks also to a most patient and accommodating Mr. Claus. 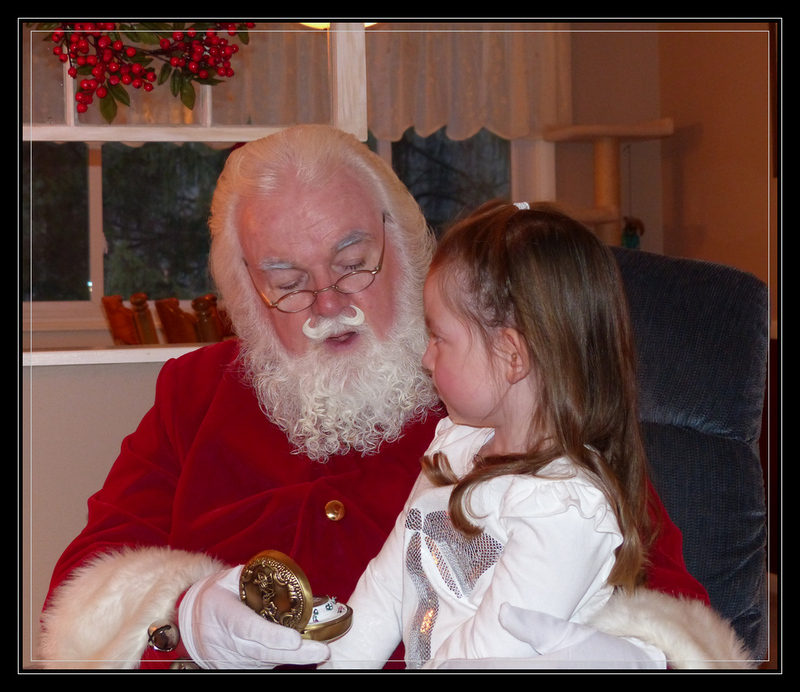 Santa gives every child his/her own special conversation, engages even the quietest of little ones, and makes sure to provide the cutest and most unrushed photo ops for eager moms and dads. I couldn't help but capture a few who were ahead of us in line. Santa's relaxed and loving demeanor is surprising and unexpected since we all know how busy he has been this past month getting ready for Christmas and making numerous appearances, some as far away as Lake Placid. I can testify to how busy he is....even though we go back a long way, I couldn't find my way into Santa's schedule! Silly me waiting until December to book such a celebrity in such high demand. I'll say in all seriousness.....if you can, consider booking a private visit with the Saratoga Santa. It is magical and an experience you will never forget. We had him a few years ago and even I was captivated. One little elf isn't really sure she needs to have an up-close, in-person relationship with the big guy. She's happy to just leave a note and keep her distance. On the other hand, there is one woman in the family who can't get enough of Santa. Considering this is the third photo I've collected of her with him, I'd say she might be a bit smitten. Today she even told him how good he smelled! HaHa. That's my mama....always ready for a laugh and a hug from Santa! In all seriousness, Dock Brown's did a fabulous job providing a beautiful venue, wonderful food and a lasting and beautiful memory at a time when the world seems to be all jumbled up and out of sorts. And Santa....well you are just the magic we all need in our lives, no matter what our age. Your unending love and passion for bringing smiles to the faces of little ones, your dedication to 'being' Santa Claus, and the ability you have to make even us Grandmas feel like children again is something really special. 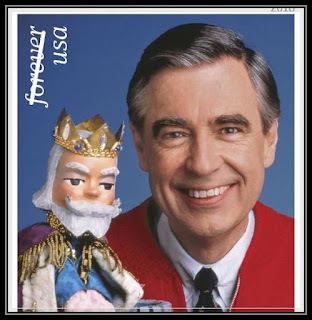 We can't thank you enough for all you do to bring happiness to young and old alike. Thank you Dock Brown's for a wonderful event! Here's hoping Santa brings you a little magic this Christmas too! The Christmas Spirit is Alive & Well ...Come In For a Tour! It looks a lot like Christmas here in the Welter household. I have a little addiction (ok, a monumental one) when it comes to Christmas. It's not about the presents, I'm pretty conservative when it comes to that. It's the stuff around the house that I can't seem to get enough of. I follow a number of home decor blogs and trust me when I say, my house in no way is or attempts to replicate any of those eye popping, jaw dropping, magazine-worthy homes. I may rival them when it comes to my love of decorating, but my home does not reflect current trends, or Instagram feeds. It reflects 40 years of memories, collecting, and perhaps some year-to-year additions to those collections. In fact, regular readers of the blog might notice I didn't do my annual Christmas series featuring my favorite shops. Trust me....it's not because I love them less. No, it's due to something more serious than that. It's because I have zero discipline and self control when it comes to Christmas merchandise. Consequently, my shop series has historically cost me a ton of cash over the years and has increased John's haul from the attic dramatically. In full disclosure, I still visited a 'few' of those shops and proved that I ... 1) still have no will power and 2) it doesn't matter how old I get or how much stuff I've accumulated, I can't resist adding more. I admit it, Christmas is my weakness and I think you'll see that by the end of this post. For now, come on in and I'll show you around! The first thing to greet you (and the biggest) is my gorgeous Christmas tree painting by one of my favorite local artists, Shelly Broughton. Shelly is the mom of the much loved and sought out owner of the Bluebird Home Decor Shop, now in Schenectady. I have several of Shelly's paintings, a few that you'll see on tour. This tree painting was a gift from a very dear friend. Sophie relaxing as she soaks up the fireplace heat. My three (yes, 3) new Shelly Broughton paintings to the left of the fireplace. I am in love with her gnome Santas and that fox has been tugging at my heartstrings since Nicolle first shared them on Instagram. I tried to resist, but hey, life is short, right? And they rounded out that end of the wall nicely, don't you think? No matter what the subject of photos I post...this family tree wall always catches attention. This was a decal project from a few years ago. Now this handsome big guy above is the handiwork of another talented crafter, Jennifer Searles (Jena's One of A Kind Creations). Jen makes all sorts of beautiful creations. I 'had' to have this fella. Sometimes little elves stop by ...... I caught this one checking things out. Sophie likes the view too! The shot above was taken from my recliner. I don't have such a bad view! That beautiful candle, holder and candle ring....Speckled Hen. Below we changed it up in the tv corner with a wooden crate full of Christmas books, a treasured Santa made by a dear old friend, a new Santa (a gift from a new dear friend) and one of my collector dolls all dressed up for the holidays. Above my collection of mostly all homemade snowmen. Earlier in the post was a shelf of Santas...again, almost all handmade by yours truly. 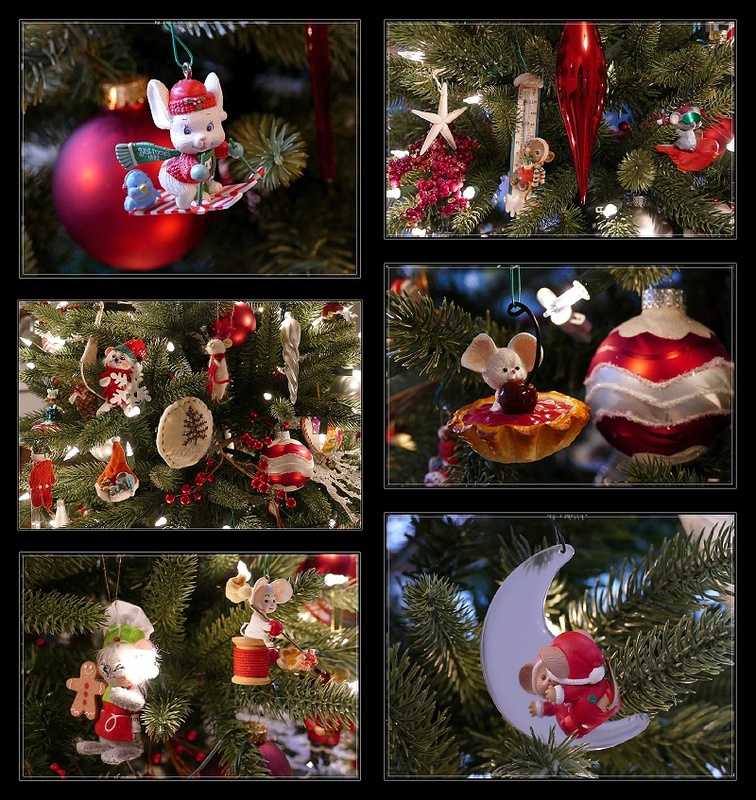 My family room tree is my 'white mouse' (red & white) tree. 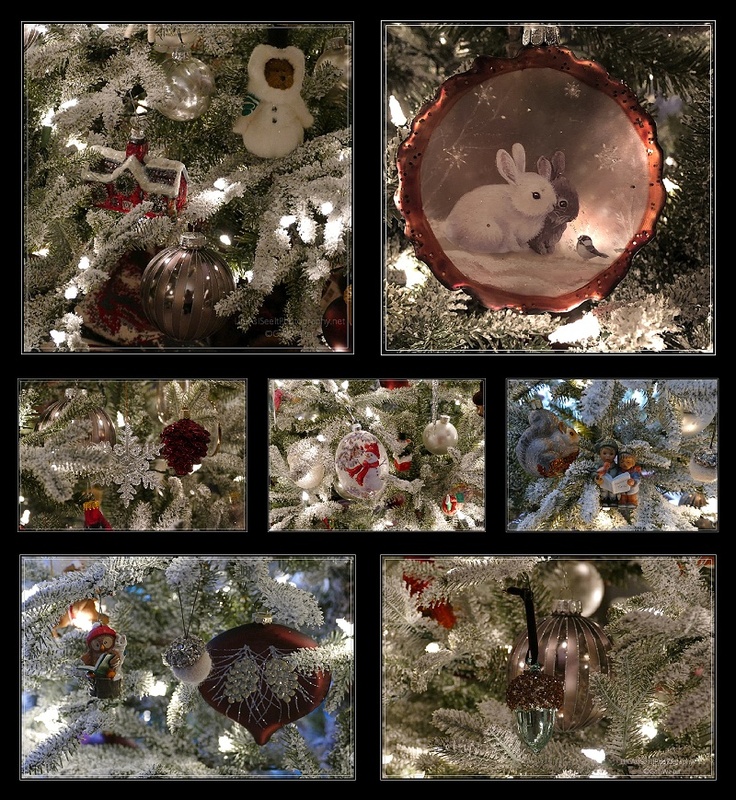 My collection of white mice began in 1980 when our first daughter was gifted a couple of Hallmark ornaments that were white mice. Since then I've gone on to collect a lot....too many to count, not just Hallmark but all kinds. The photo above (behind the bears) features another of Shelly's paintings, a sea bird. This year we opted to use our tiny nativity for a change....same message, just smaller scale than our huge one. Thanks for stopping by and indulging my addiction. Whether you're surrounded by your own beautiful decor or opt for a more controlled display....I'm hoping that your heart is full and your blessings plentiful this Christmas and throughout the New Year. 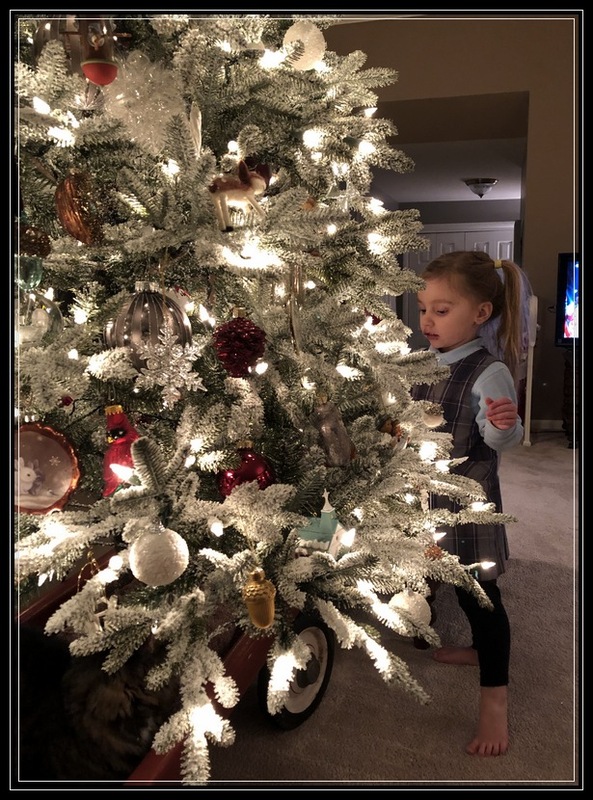 For more information about some of my favorite sources for all things Christmas (and everyday), I've included links below. Merry Christmas One and All!